Is your precious pooch is facing the problem of flies while having food outdoor or inside? No need to get irritated. I know as a dog owner it’s very challenging for you to provide the healthy and sound condition to your four-legged friend while he enjoys his food. 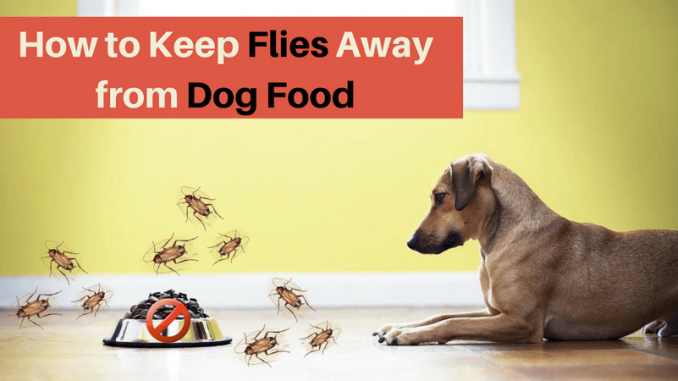 If you are willing to deal with the steps regarding how to keep flies away from dog food, then this post will surely provide you breathe a sigh of relief. How to Keep Flies Away from Dog Food? Let’s move ahead with the informative points to be considered to keep away the flies from dog food. Fix the time of the feeding- Make sure your pet does not leave any leftover food. For this, you should schedule the fix hours of feeding so that your canine develops the habit in the same manner. You must also develop an idea of how much quantity of food your pet requires in single time so that you plan the diet accordingly. In this way, the food will not be wasted, and as a result, flies will not get the chance to sit over remaining food. Remove dog poop- Immediately clean the poop of your pet as flies get attracted to the wastage excreted from the animal’s body. Be particular that you keep your area moist free as wet areas are prone to the continued existence of the flies. Look after your pet- Keep your beloved pet clean and tidy as the untidy and messy condition of your pet will invite flies on his body. Dispose garbage away from the area where your pet stays. Install screens- Cover the openings of the windows and doors with the screens or net so that flies, mosquitoes and other worms do not enter your house and disturb the environment. It will help your pet to remain joyful. Plantation of herbs- You can plant different types of herbs like basil, bay leaf, mint, and rosemary which will keep away flies. Lavender, sweet woodruff, and tansy will be toxic to the flies and will serve you nicely. Role of essential oils- You can apply essential oils of lemon, sandalwood, lavender, and rosemary that will protect your faithful pet from fly strikes. You can choose any one type of essential oils and prepare the solution of the same in the spray bottle by adding water to it. Then spray the solution on the body of your loving pooch to repel the flies. Cloves and lemon- Cut the lemon into two pieces and then poke the cloves on the lemon keeping the bud up. Then keep these pieces near your pet’s food but make sure that pooch does not reach to it. The arrangement of cloves and lemon will help in resisting flies. Zip-top bag- Make use of zip-top bag filled with water. Closely zip the bag so that air is removed from it. Near your pet’s food hang the bag which will refract light. It will confuse the eyes of the flies, and as a result, they will leave the place. You can hang it outside or around your house in plenty of numbers which will make your place flies free. Lemongrass water- Add lemongrass oil with hot water and then spray the solution on the susceptible areas like openings of doors and windows from where flies can quickly enter. You can also spray near the areas where you feed your canine. All the above guidelines will assist you in keeping away flies from your loving pet. All these are easy and simple measures which you can undertake to get rid of the problem of flies’ attack. If you want to move the market made product, then you can try Flys off for dog that will work as the fly repellent for your doggie. Keep your furry friend fit by providing nutritious diet as flies are not attracted towards strong and healthy body rather feeble and sickly body appeals them more. Make sure the diet you offer to your pet must be nutritionally rich in quality and properly balanced so that he can save himself from fly attacks. Acana vs Orijen Dog Food – Which One is Best?